Things have remained rather busy around here and as usual there is not much I can report that doesn't result in #0 shaking their head at me. I have been on something of a lockdown on this point due to the "Sensitive Security Information" they feel I have been a bit too casual with in the not too distant past. Alas, as I have had my Tyrian Doppelganger in Guild Wars 2 note, there is hardly a reason to have a Security Chief if you never heed their counsel. Still, if little has changed here- it would seem less has changed out there. People are still imagining they are accomplishing something by loathing a bit of flappy fabric and flirting with the idea of purging it even from museums. 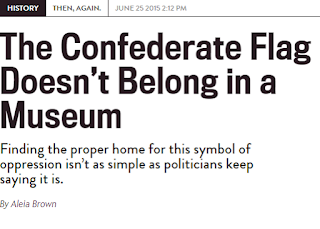 Let's just pull everything that references bad things out of museums then, shall we? 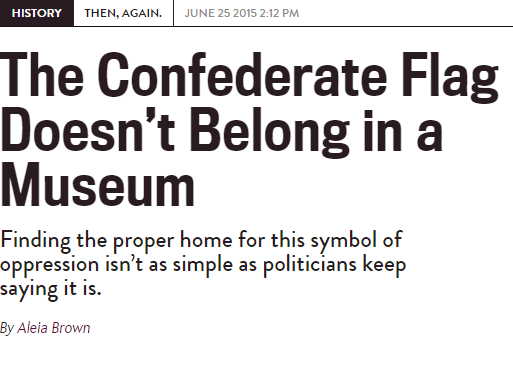 The article itself, says that maybe it might be OK to have Lee's battle standard in a museum- but only if it provided the context and history behind the flag. Which is, I would agree, rather apt information to have next to a museum exhibit. Is that unusual for museums these days? I haven't really been out to one in some time admittedly. Meanwhile the vicious slapfight wherein smug would be heroes fight the evil misogynistic trolls that have been painted on a wide swath of fairly average people continues. Apparently after Aljazeera hosted a moderated discussion between Gamergate and AntiGamerGate folks, viewable here, they have gone out of the way to avoid the horrible threat of facing a forum in which the conversation doesn't start from the agreed upon position that everyone who has used a certain hashtag is pure evil. As such, Mr. Koretzky's SPJ Airplay is going to be a bit lopsided as the A-GG folks have utterly refused to represent. A-GG loyalists have apparently decided it is far easier to just insist Michael Koretzky and every person involved in this is in fact a secret GamerGator. Also that last link had graphics like this. Referencing, among other things, the time Mr. Koretzky received a death threat from Marilyn Manson. So, worth reading I would say. People will see Airplay and they will ask why AGG refused to turn up and yielded the stage to the likes of Milo from Brietbart. I would also like to take a moment to remind viewers of Mr. Koretzky's vastly superior blog. But it's not all bad, in fact even the above is mostly just silly with only the chance of getting bad. On the historical scale things continue to improve and the following is pretty great.